Sunday. The day of the Temple Burn. For many folks, they come to Burning Man to see The Man burn, which happens Saturday night. It’s the big focal event of the week. The iconic structure that has been our beacon for the week is burned in a huge celebration of fireworks, dancing, art cars and cheers – and then a big kaboom. It’s a big party. And many folks leave right after it. For me however, the burning of the temple is the core of the event. The temple is built a bit behind the man – and it’s generally designed and constructed by a different team each year. It’s the place where people go to write the things they need to release or manifest – the death of a loved one, forgiving, committing to change, etc. I visit is several times during the event, and reading some of the things written will bring you to tears. It’s a very somber place, a spiritual center of the community built at Black Rock City. 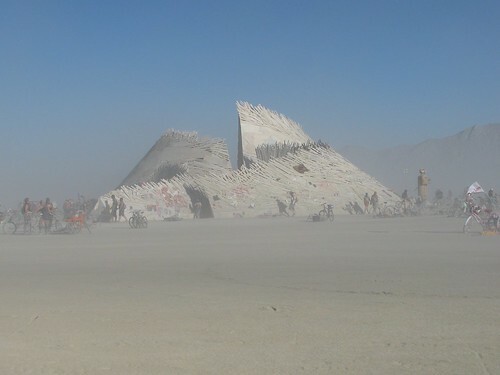 It defies all of the mainstream stories of Burning Man being a big naked drunken party in the middle of the desert. It’s the reason I have returned every year.